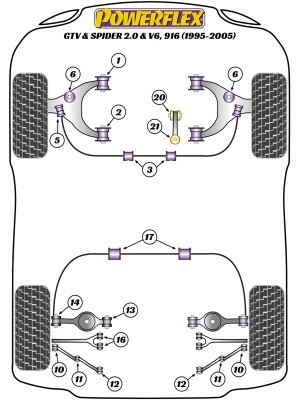 PFF1-801 and PFF1-802 are designed to fit genuine Alfa control arms. If non genuine arms are fitted, the pin diameter at the back of the arm may be different. If this is the case, please contact your Powerflex distributor first. PFF1-814 Fits V6 models only. PFF1-820 Fits 1.6 to 2.0 petrol engines. PFF1-821 Fits 1.8 & 2.0 16v models with extruded bracket.